Thus, an imprinting roller will penetrate or settle into the soil to the depth where the opposing forces are equal or balanced. For a full-tooth imprint, these forces balance when the teeth penetrate the soil halfway, because of the embossing effect. When soil load bearing capacity is too high or the soil is too hard for halfway penetration of the imprinting teeth, additional weight can be loaded onto the imprinter or the soil can be softened by ripping or wetting. Usually the best alternative is to add more weight up to a static imprinting pressure of about 207. Imprinters are designed to have an adjustable range of static imprinting pressures of 104 to 207 KPa (15 to 30 psi). For the 2.43-meter (8-foot) imprinter with straight angles, the base 1816 kg (2-ton) weight gives an imprinting pressure of about 104 KPa (15 psi). Loading the imprinter with an additional 1816 kg (2 tons) raises the imprinting pressure to about 207 KPa (30 psi). Thus, as a rule of thumb, the static imprinting force per 30 cm (foot) of roller length should range from 227 kg (500 pounds) when the imprinter is unloaded to 454 kg (1000 pounds) with a full load. Imprinter loading is accomplished by filling the imprinting roller core with water and by mounting water tanks or soil boxes on the imprinter frame. Tanks or boxes are mounted on both sides of the seed box such that the weight is balanced over the axle of the imprinting roller. Tanks are the same size as the imprinting roller core, whereas soil boxes are about the size of the seedbox. The outer side of soil boxes should be removable to expedite emptying of the well settled soil. Tillage, before imprinting, kills existing vegetation, covers plant litter, breaks down soil structure, and encourages weed growth. Thus, tillage should be avoided as an alternative to adding weight to the imprinter frame. However, if tillage is required because of deep soil compaction, ripping is less destructive than disking. Also, mycorrhizal inoculum can be injected several inches deep behind the ripping shanks. Another alternative to ripping hard soils, is to imprint them twice. For instance, if the first imprinting is only one-half of the full depth, the second one will be markedly deeper because imprinting teeth tend to get in gear with the first imprints and then bite deeper into the soil. The static pressures of 104 and 207 KPa (15 and 30 psi) are based on the soil contact area resulting from the halfway penetration of 6 teeth for the 240 cm (8-foot) imprinter. The general formula for the number of teeth in contact with the soil is 1.5 times the number of in-line teeth or 0.75 times the length of the imprinting roller in feet. The quantitative soil mechanics of land imprinting is extraordinarily complex and poorly understood. Thus, the analysis presented here is only a greatly simplified first approximation. Finally, it should be noted that the actual or dynamic imprinting pressures are much greater than the static pressures. Soils with a hardness of 690 KPa (100psi), as measured with a cone penetrometer, can be imprinted by an imprinter producing a static pressure of 207 KPa (30 psi). Thus the momentum of the revolving imprinting roller apparently increases imprinting force by more than 3 times. Just as stepping lightly on soft soil leaves no footprints, stamping, running and jumping does. Another explanation is that the imprinted soil weakens the adjacent non-imprinted soil, thereby lowering the imprinting force required as the imprinter rolls along. Under field conditions, soils usually vary greatly in hardness from point to point with some areas requiring ripping and some not. A tractor equipped with a ripping tool bar and a draw bar for towing the imprinter allows the operator to selectively rip only the hard spots while imprinting the whole area as shown in Fig. 1. Click on the menu to left or Dr. Robert Dixon picture on right to view S ummary and References. The imprinting tow frame can be loaded using the tractor's hydraulic system and 3- or 4-point hitches or by soil boxes attached to the tool bar frame. 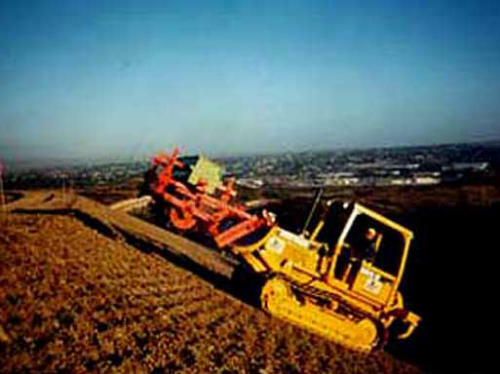 The hydraulic system that operates the dozer blade is used to load the steep-slope imprinter. Thus, an imprinting roller will penetrate or settle into the soil to the depth where the opposing forces are equal or balanced. For a full-tooth imprint, these forces balance when the teeth penetrate the soil halfway, because of the embossing effect. When soil load bearing capacity is too high or the soil is too hard for halfway penetration of the imprinting teeth, additional weight can be loaded onto the imprinter or the soil can be softened by ripping or wetting. Usually the best alternative is to add more weight up to a static imprinting pressure of about 207. Imprinters are designed to have an adjustable range of static imprinting pressures of 104 to 207 KPa (15 to 30 psi). For the 2.43-meter (8-foot) imprinter with straight angles, the base 1816 kg (2-ton) weight gives an imprinting pressure of about 104 KPa (15 psi). Loading the imprinter with an additional 1816 kg (2 tons) raises the imprinting pressure to about 207 KPa (30 psi). Thus, as a rule of thumb, the static imprinting force per 30 cm (foot) of roller length should range from 227 kg (500 pounds) when the imprinter is unloaded to 454 kg (1000 pounds) with a full load. Imprinter loading is accomplished by filling the imprinting roller core with water and by mounting water tanks or soil boxes on the imprinter frame. 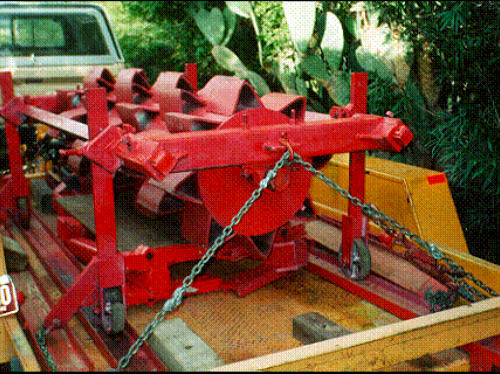 Tanks or boxes are mounted on both sides of the seed box such that the weight is balanced over the axle of the imprinting roller. Tanks are the same size as the imprinting roller core, whereas soil boxes are about the size of the seedbox. The outer side of soil boxes should be removable to expedite emptying of the well settled soil. Tillage, before imprinting, kills existing vegetation, covers plant litter, breaks down soil structure, and encourages weed growth. Thus, tillage should be avoided as an alternative to adding weight to the imprinter frame. However, if tillage is required because of deep soil compaction, ripping is less destructive than disking. Also, mycorrhizal inoculum can be injected several inches deep behind the ripping shanks. Another alternative to ripping hard soils, is to imprint them twice. For instance, if the first imprinting is only one-half of the full depth, the second one will be markedly deeper because imprinting teeth tend to get in gear with the first imprints and then bite deeper into the soil. The static pressures of 104 and 207 KPa (15 and 30 psi) are based on the soil contact area resulting from the halfway penetration of 6 teeth for the 240 cm (8- foot) imprinter. The general formula for the number of teeth in contact with the soil is 1.5 times the number of in-line teeth or 0.75 times the length of the imprinting roller in feet. The quantitative soil mechanics of land imprinting is extraordinarily complex and poorly understood. Thus, the analysis presented here is only a greatly simplified first approximation. Finally, it should be noted that the actual or dynamic imprinting pressures are much greater than the static pressures. Soils with a hardness of 690 KPa (100psi), as measured with a cone penetrometer, can be imprinted by an imprinter producing a static pressure of 207 KPa (30 psi). Thus the momentum of the revolving imprinting roller apparently increases imprinting force by more than 3 times. Just as stepping lightly on soft soil leaves no footprints, stamping, running and jumping does. Another explanation is that the imprinted soil weakens the adjacent non-imprinted soil, thereby lowering the imprinting force required as the imprinter rolls along. Under field conditions, soils usually vary greatly in hardness from point to point with some areas requiring ripping and some not. A tractor equipped with a ripping tool bar and a draw bar for towing the imprinter allows the operator to selectively rip only the hard spots while imprinting the whole area as shown in Fig. 1. Click on the menu to left or Dr. Robert Dixon picture on right to view S ummary and References.